Indoor Dusk to Dawn Light Control for Incandescent Bulbs, This light control offers a measure of safety, security and convenience by automatically turning your light On at dusk, Off at dawn. It can simulate home occupancy, ends coming home to a dark house. 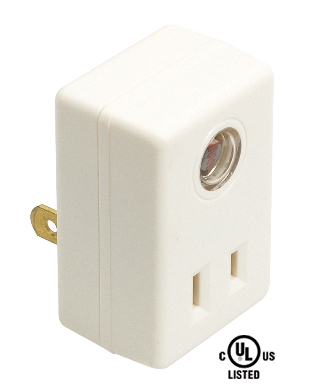 Turns incandescent lights On at dusk, Off at dawn, Requires no seasonal adjustments as with timers, Indoor use only, 300 Watts max, Plastic Housing Material, Plug-In connection, Height x Width x Depth: 3" x 2.1" x 1.8"
No reviews yet for the Indoor Dusk to Dawn Light Control for Incandescent Bulbs.